You hear footsteps coming down the hall, a squeaky door opens and closes and suddenly you are in Schroeder’s world. 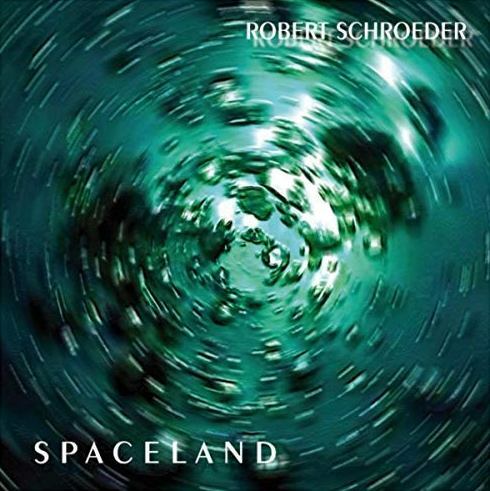 The German synthesizer pioneer, originally discovered by Klaus Schulze in the late 70s has over three dozen albums to his credit to date, and I’m sure there will be many more, so where to better begin discovering his musical legacy than right here and now, with Spaceland. A reference point for the eight crossfaded tracks here might be late 70s Tangerine Dream from the Stratosfear / Cyclone / Force Majeure period, but certainly that would just be a starting point, and Schroeder has a wealth of powerful new sounds and samples in his quiver that TD of the day probably never even dreamed of. The power of these softly sequenced ambient cinematic soundscapes mostly comes to us via analog and modular synths, but we also hear brilliantly sampled percussives, Mellotron, sampled soaring female voices (on “Upcoming Life”), some parts (I believe it’s the main body of the track “Ozone”) might even remind of the expansive midsection of Pink Floyd’s “Echoes,” though nothing herein seems particularly derivative, it’s just the masterful workings of a well defined and established style. Schroeder has even taken the liberty of presenting two versions of the cut “Dream Garden,” a shorter seven-minute version near the beginning of the program, and an expanded twelve-minute version as the second-to-last track. The sounds used span the entire spectrum from thundering lows to brilliant melodic highs and galvanizing textures that overflow and engulf the listener and relax the spirit. Even at roughly 70 minutes total, this is one of those discs where you just want to keep hitting the repeat button to stay in that magical place where it takes you.